Previously we talked about related useful topics like image sensor format, crop factor, four thirds standard etc. In this article, straightforwardly we will discuss a much debated topic full frame vs crop (APS-C) image quality difference for sensor size from technical & result perspective. Nowadays there are different types of professional to high end cameras with interchangeable lenses like Bridge Camera, DSLR, DSLM, DSLT, Rangefinder for all types of users who needs more than a point and shoot camera. Technology used in these camera varies and answer actually go slightly complicated. Full Frame vs Crop (APS-C) : Image Quality Difference For Sensor Size Really Differs? For practically usable camera, we face two major sensor formats – Full Frame and APS-C Sensor format. We will discuss only these two. Kodak states that 35mm film has the equivalent of 6,000 pixel horizontal resolution. Medium format digital camera has the biggest size of sensor but such models are limited in number. Next option is full frame señor format which has an image sensor that is of the same size as a 35 mm (36×24 mm) film. In the above introductory paragraph, the links we provided has mention of other than APS-C sized sensor formats. APS-C sensor cameras have 22x15mm sensors. APS-C stands for Advanced Photo System type-C which is an image sensor format approximately equivalent to size of Advanced Photo System classic negatives of 25.1×16.7 mm with an aspect ratio of 3:2. Sony Cyber-shot DSC-RX1 and Sony Cyber-shot DSC-RX1R are example full-frame compact cameras with fixed lens. The cameras of lower categories have smaller sensors. Height and width of the sensor maintain the same proportion that have in full format (i.e. 4:3), but both are reduced in smaller size. The relationship between the smaller size sensor and the size of the negative analog is said as crop factor. In digital photography, the crop factor of an image sensor format is related to the ratio of the dimensions of a camera’s imaging area compared to a reference format relative to 35 mm film format as a reference. The most commonly used definition of crop factor is the ratio of a 35 mm frame’s diagonal (43.3 mm) to the diagonal of the image sensor in question. Given the same 3:2 aspect ratio as 35mm’s 36 mm × 24 mm area, this is equivalent to the ratio of heights or ratio of widths; the ratio of sensor areas is the square of the crop factor. In other words, the crop factor is the value for which you have to multiply the size of a small sensor to get the sensor size of a DSLR. Some common values that the crop factor can take in the SLR are – 1.3X, 1.5X, 1.6X, 2.0. This list is not comprehensive. As example, Sony DSLT usually usually have 1.55× crop factor. A 1.3× Focal Length Multiplier is also known as APS-H. Actual multiplier factor is 1.255× to 1.33× for so called many “full frame”. Basically, the 35mm film in a photography camera loaded the film horizontally, with the frames advanced with a top-loaded lever or wheel mechanism, whereas a film camera loaded the film vertically through the shutter. The FOV seen by a movie camera shooting super-35mm film stock was different from a photograph. Because it was loaded sideways, the aspect ratio was different and the frame was reduced by a 1.5x crop. In the photography world, this is roughly the view of an APS-C crop camera (1.6x). We have a mess of reference numbers these days. This confusion really took over during the DSLR revolution. People were buying SLR lenses for crop cameras that were rated in full frame 35mm photography equivalents. When buying a micro 4/3 25mm lens, the literature says it is a 50mm full-frame equivalent. Instead of trying to always make a distinction, most of us have accepted comparing crops and FOV. Technically APS-C should take better looking video. Yes, Sony DSLT does that. They have way to practically convert to ammeter grade video camera with APS-C sensor. As because 35mm film camera is quite different than a full frame digital camera, it is basically not possible to compare and a crop factor of 1.255× is minimum for most of them. APS-C digital camera has a crop factor of 1.55×. It is not exactly possible to compare full frame digital camera and APS-C digital camera in that way. Both are away from 35mm film. Dimension only one point. Crop factor is inversely proportional to the square root of sensor area which is used for estimating image sensor performance. For a given exposure, for example for a fixed focal-plane illuminance and exposure time, larger image sensors capture more photons and expected to produce images with less image noise compared to smaller sensors. When two different sized image sensors with the same aspect ratio, same resolution will use similar technology, then the larger sensor will have better signal-to-noise ratio by a factor equal to the ratio of the two sensors’ crop factors. 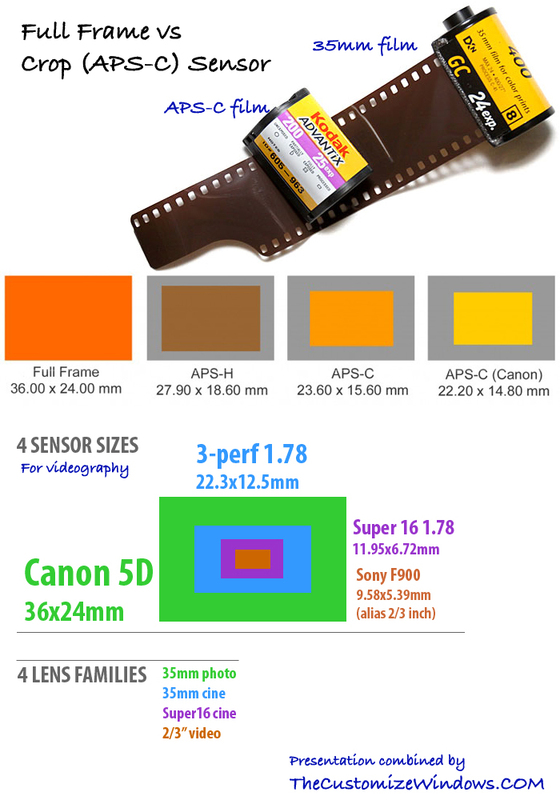 In other word – APS-C digital camera need to have 1.55× times higher resolution to compare with 35mm film. 35mm full frame including Canon EF, Leica M9, Nikon FX, Sony α, FE-Mount, Sony RX1 will be closely to crop factor of 1.0. Medium format including Hasselblad will have crop factor of 0.79 to 0.64. Canon EOS-1D Mark IV with 16 megapixel sensor will not deliver very superior camera optics in digital format compared to Sony A68 DSLT. Leica M (Typ 262) will deliver superior optics in digital format than Sony A68 DSLT. Lenses will be far more expensive, heavier to counteract the above issues. Sony a6000 will performs worser than Sony a7II because the later have a higher build quality. If we ever get a custom Sony a7II with APS-C sensor of same quality like that of Sony a7II, on print, difference will be very less with the exception of way you compose. You need prime lenses recommended by the manufacturer. We tested Sony A68 to compare with Leica M9 and really can say that Sony A68 aka a good build APS-C with recommended lenses no way inferior compared to “full frame” only with minor issue with noise at certain situations. We would say that for wider area like interiors, Landscapes you need 20mm f/1.8 for APS-C and 24mm f/1.4 for “full frame”. Long shot unless is dark, sarcastically a good build APS-C will perform better with 300mm lens. As example Sony has 3 APS-C A-Mount Prime Lenses from their production -30mm f/2.8 Macro, 35mm f/1.8 and 50mm f/1.8. On long zoom side, they have one 18–250mm f/3.5–6.3. They do have a 55–300mm but with f/4.5–5.6 and price is half compared to the 18–250mm one. 35 mm f/1.8 SAM is equivalent to 52.5mm on full frame. If you upgrade camera to full frame, you can mount it but capture will be as APS-C. Sony’s proprietary top range is not recommended by Sony for APS-C with same A mount. Ofcourse Zeiss has lens for Sony. For full blown professional quality, Leica, Hasselblad cameras worth investment for the next 100 years. You can mount 50 years old Minolta A mount directly on Sony’s body. Kodak’s “digital film” aka sensor is used by Leica. It is meaningless to fight with “full frame” from Canon, Nikon with low budget for cheap lenses. Hasselblad definitely would do better work but unlike film camera, these camera with “film” inside will die after 1.5 decade. Digital camera manufactures could add an option to load film roll to test with Kodak’s film. This Article Has Been Shared 3484 Times! With Consumer Grade DSLR and Low End Lens, Bokeh Will Start to Show Various Distortions. Here Are Some Good Bokeh Lens For Professional DSLRs. Scan Photography or Scenography is the Usage of Flatbed Scanner For Digital Photography to Get High Resolution Photography Mostly in DIY Way. In This Article, We Talked About Soap Bubble Bokeh And Swirly Bokeh, They Are Legendary Bokeh Effects To Add Extra Value In Art Photography. Cite this article as: Abhishek Ghosh, "Full Frame vs Crop (APS-C) : Image Quality Difference For Sensor Size," in The Customize Windows, May 20, 2017, April 21, 2019, https://thecustomizewindows.com/2017/05/full-frame-vs-crop-aps-c-image-quality-difference/.